A proposal to develop a site in Little Bay for 45 new residential apartments is being contested in the Land & Environment Court, with Randwick Council opposing the proposal due to environmental impact and built form. The owners of the 1.161ha site at 11 Jennifer Street, Little Bay are seeking court approval for the construction of a three (3) storey residential flat building containing forty-five (45) units above basement level parking for sixty seven (67) cars and associated landscaping. A hearing set for 3,4 and 5 April 2019 has been cancelled, after the applicant recently filed a motion to the court seeking to rely on amended plans. On 27 February 2019 the court granted the applicant leave to rely on the amended plans which Council placed on public exhibition until 5 April 2019. An advertisement was placed in the Southern Courier and letters sent to adjoining and neighbouring residents. All submissions received during the public exhibition period will be submitted to the Court for consideration and referenced in Council’s amended Statement of Facts and Contention that is required to be filed and served by 30 April 2019. The principal change to the development is a reconfiguration of the building footprint to remove built form from the central northern part of the site and to relocate the built form to lie predominantly along the eastern and western boundaries of the site so as to limit the impact on the Critically Endangered Ecological Community of Eastern Suburbs Banksia Scrub through the centre of the site. The amended proposal will provide for 45 dwellings, 5 of which will be in a townhouse form with the others being apartments. The Court has fixed the hearing dates for the proceedings on 4 to 6 November 2019. The property at 11 Jennifer St is located on the eastern side of Jennifer Street at the intersection with a crown road providing access to St Michael’s Golf Course. It is a trapezoidal shape with a 110 metre frontage to Jennifer Street. It has a site area of approximately 1.161 ha. 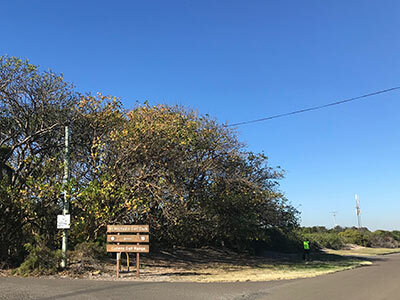 The site contains Eastern Suburbs Banksia Shrub (ESBS) which has been identified as a Critically Endangered Ecological Community (CEEC) in the Sydney Basin Bioregion. The site is zoned R3 Medium Density residential under Randwick Local Environmental Plan 2012 (RLEP) and the key development standards are an FSR of 0.75:1 and a maximum height of 9.5m. Kamay Botany Bay National Park is to the south of the site and to the east is St Michael's Golf Course and driving range. There is a health facility for ‘Spinal Cord Injuries Australia’ to the north of the subject site. The site was the subject of earlier development applications which have either been withdrawn or refused consent. Development Application DA-505/2017 was originally lodged seeking the construction of a five to six storey residential flat building containing ninety-six (96) units. The application was amended to provide for a 3 storey residential flat building containing 45 units, basement level parking for 67 cars and associated site and landscaping works. It was originally lodged with Council on 15 August 2017. There are also two other current DAs for the site that involve staging of the development, but are otherwise reflective of the proposed development that is currently under appeal. These two other DAs have now been joined in the appeal and will be subject of the hearing.